The worldwide ampoules and syringes market is witnessing a substantial rise in its valuation. Analysts expect the scenario to remain positive over the forthcoming years, thanks to the continual advancements in the biologics and biosimilars industry, influencing the demand for ampoules and prefilled syringes. The patent expiry of a number of biologics has led to the introduction of biosimilars in the global market, which is the main factor behind the significant growth of the market for ampoules and syringes across the world. On the other hand, the high cost of the temperature-controlled packaging needed for temperature-sensitive drugs and the increasing product recalls due to breakages and leachables may limit the market’s progress to some extent in the near future. In 2015, the global market for ampoules and syringes stood at US$5.1 bn. Progressing at an impressive CAGR of 10.50% between 2016 and 2024, the opportunity in this market is expected to surpass US$12.4 bn by the end of 2024. The global market for ampoule and syringes is broadly analyzed on the basis of the type of ampoule product and the type of syringes. Glass ampoules, plastic ampoules, cyclic olefin polymers, and cyclic olefin copolymers are the key ampoule products found in this market. With a share of nearly 84%, the glass ampoules segment led the overall demand for ampoules in 2015. Thanks to the heat-resistant feature of glass ampoules, their demand is likely to remain high over the forthcoming years. Plastic ampoules, classified into PVC, polyethylene, polypropylene, are also gaining significant momentum across the world. The demand for polyethylene ampoules is much higher than other plastic ampoules, currently, which is expected to witness impressive growth opportunities compared to PVC and polypropylene ampoules in the near future. Glass syringes and polymers syringes are the two main types of syringes available in this market. Among these, the demand for glass syringes is greater than polymer syringes and the situation is anticipated to continue to be same over the next few years. The global ampoule and syringes market is spread across Europe, the Middle East, and Africa (EMEA), Asia Pacific (APAC), Countries under the North American Free Trade Agreement (NAFTA), namely, the U.S., Canada, and Mexico, and the Rest of the World. Of these, EMEA has acquired the leading position in this market and is expected to retain it over the years to come, thanks to the early adoption and the rising awareness in the region. Europe is the key contributor to the EMEA market for ampoule and syringes. The NAFTA market is also projected to grow steadily in the near future, thanks to the presence of leading pharmaceutical companies in this region. Some of the key players functioning in the global market for ampoule and syringes are Schott AG, Becton, Dickinson and Co., Gerresheimer AG, West Pharmaceutical Services Inc., Vetter Pharma International GmbH, Nipro Corp., Stevanato Group, JSR Corp., TOPAS Advanced Polymers, Baxter International Inc., B. Braun Melsungen AG, Terumo Corp., Unilife Corp., Medtronic, Ypsomed Holding AG, and Zeon Corp. This report provides forecast and analysis of the ampoules and syringes market on the global and regional level. The study provides historic data of 2015 along with forecast from 2016 to 2024 based on volume (Mn Units) and revenue (US$ Mn). It includes drivers, restraints and the ongoing trend of the ampoules and syringes market along with their impact on demand during the forecast period. The report also comprises the study of opportunities available in the market for ampoules and syringes on the global and regional level. It includes value chain analysis with list of raw material supplier, manufacturer, importer, distributors, wholesaler, retailer, hospitals and mail order pharmacies in the value chain. In order to provide the users of this report with comprehensive view of market, we have included detailed competitiveness analysis and company players. The competitive dashboard provides an elaborate comparison of ampoules and syringes manufacturers on parameters such as company’s revenue, unique selling propositions and key strategic developments. The study encompasses market attractiveness analysis, by product type and by geographic region. Market statistics have been estimated based on average consumption and weighted average pricing of by product type in ampoules and syringes and the revenue is derived through regional pricing trends. Market size and forecast for each segment have been provided in the context of global and regional markets. 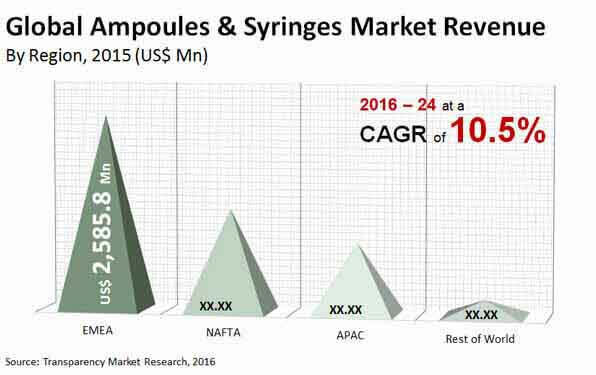 The ampoules and syringes market has been analyzed based on expected demand. Prices considered for the calculation of revenue are average regional prices obtained through primary quotes from numerous ampoules and syringes manufacturers, suppliers, and distributors. All key end users have been considered and potential applications have been estimated on the basis of secondary sources and feedback from primary respondents. Regional demand patterns have been considered while estimating the market for various end users of ampoules and syringes in different regions. Top-down approach has been used to estimate the ampoules and syringes market by regions. Market numbers for global product type has been derived using the bottom-up approach, which is cumulative of each region’s demand. The market has been forecast based on constant currency rates. A number of primary and secondary sources were consulted during the course of the study. Secondary sources include Factiva, World Bank, Packaging Digest, Plastic Manufacturers Association, Society of the Plastics Industry, Grocery Manufacturers Association (GMA) and Hoover’s, and company annual reports and publications. The report provides detailed competitive outlook including company profiles of key participants operating in the ampoules and syringes market includes Becton, Dickinson and Company, Schott AG, Gerresheimer AG, West Pharmaceutical Services, Inc., Nipro Corporation, Unilife Corporation, Vetter Pharma International GmbH, Stevanato Group, TOPAS Advanced Polymers, JSR CORPORATION, Baxter International Inc., Terumo Corporation, B. Braun Melsungen AG, Ypsomed Holding AG, Medtronic, Zeon Corporation.